If you followed my recent video tutorial on enabling Ubuntu/GNOME’s Tracker search tool, you should now be enjoying the ability to search the files on your system. 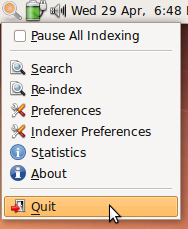 During a recent upgrade to Ubuntu 9.04, which was recently released, I found that the Tracker search tool index had become corrupted. I tried to tell Tracker to rebuild the index, but experienced some weird issues. In this quick tip, I’ll show you how to avoid this and other issues by deleting Tracker’s index and cache manually, so that it can start ‘from scratch’. Note that if you are having issues with tracker, it is worth trying to rebuild the index from the graphical interface first. This tip is a last resort if you need to clear everything out from scratch and start it again. If you’re happy with the settings you have, you may want to leave the configuration file intact, and just wipe out the data files and index cache. First of all, you need to go ahead and quit the Tracker application in the system tray. And finally, carefully delete the files listed above (excluding the config file, if you don’t think you need to clear that out as well). To restart Tracker, I recommend that you log out and log back in so that trackerd and the system tray applet both restart properly. You should then be able to reconfigure it from the beginning as detailed in the original tutorial. And that should be it – Tracker should rebuild itself from scratch. Useful to know for if things go wrong!